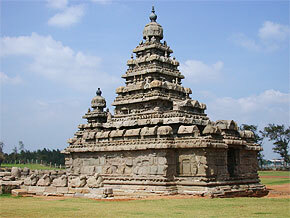 It was during the reign of King Narasimha Varman I, the name Mahabalipuram was changed. It was renamed mahabalipuram which is called till now. There is a story behind. The name Mamallpuram king Narasimha Varman I was a great and valiant warrior. He was given the title Mamalla which means ‘the great wrestler’ so the name was converted from Mahabalipuram to mahabalipuram considering the great king and his achievements. After the decline of the Gupta Dynasty, the pallavas rose to the pioneer in south India. They ruled over from the 3rd century till the end of the 9th century A.D. The best period of their rule was between 650 and 750 AD and this period was called the Golden Age of the pallavas. The pallavas were very powerful. They were profound thinkers.